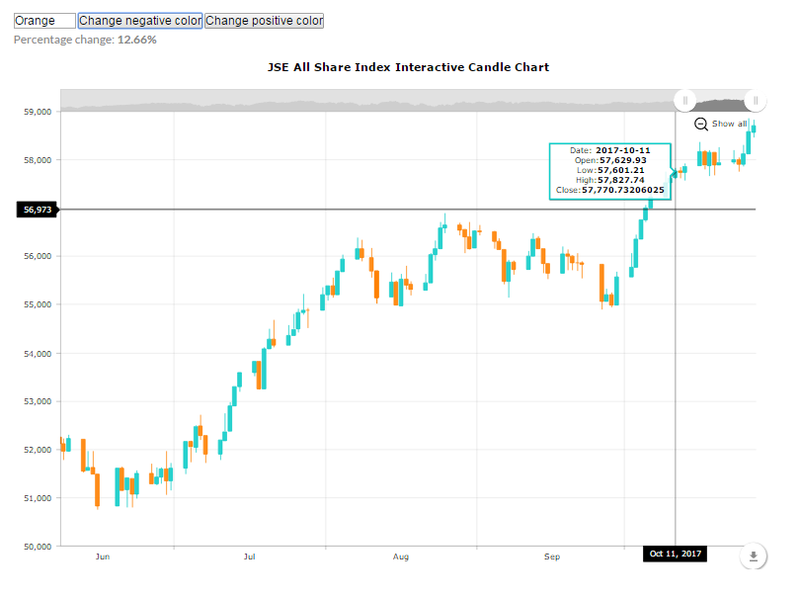 The aim of this page is to provide our readers and visitors with an interactive candlestick chart of the JSE All Share Index. Note our JSE All Share Index Chart is updated at least once a week. For additional sectors or data please contact us. Users can zoom in and out. And as users zoom in and out the graph recalculates the percentage change from the closing value of the All Share Index in the beginning of the chart to the closing value of the All Share Index at the end of the chart. Users can change the colours of both the negative and positive colours. In addition to this users can download the data used to make this chart (using the arrow at bottom left of graph). Readers can also draw lines, make comments on graph etc and then export the graph with comments and lines as a image. We trust you will enjoy the additional feature on our website. We will look to add more features, colours and information to the graphic as time goes on. Currently the market (All Share) is being driven mostly by the big heavy weight Naspers (NPN), with it on its own moving the market in South Africa. As our JSE pie chart article showed, Naspers makes up roughly 19.9% of the All Share. In addition to the JSE All Share chart above, we created a JSE All Share Calendar tracker which tracks the JSE' daily performance on a Calendar as well as discussing main events affecting the South African stock market and the broader economy at large. This page can be accessed here.